Until the unit hits the ground with a thud. Thanks for all the info! No water damage thankfully. The seller was a little surprised when I pulled out a moisture meter. Wonder what kind of price im looking at for these repairs? Whether we sell it or keep it, I still have to get it repaired. My conscious wont allow me to drop a safety issue on another family. We love the trailer and even if we bought another lippert frame, we would probably be going the route of reinforcing everything anyways. Without being able to "see" the whole thing in person, a few questions. How does the trailer track now? Unusual tire wear? Those bends in the leaf spring mounts (hangers) look suspicious, like, as if, . . . . . . someone bent the frame, . . . . intentionally to repair an alignment issue. Are there other bent parts that are clearly damaged? From the photos, if I'm reading them correctly, the cracks in the structure occur at a location of minimal stress. Hummmmmmmm. I'd hate to see you "straighten everything out" only to find that the trailer is now out of alignment and pulls sharply. 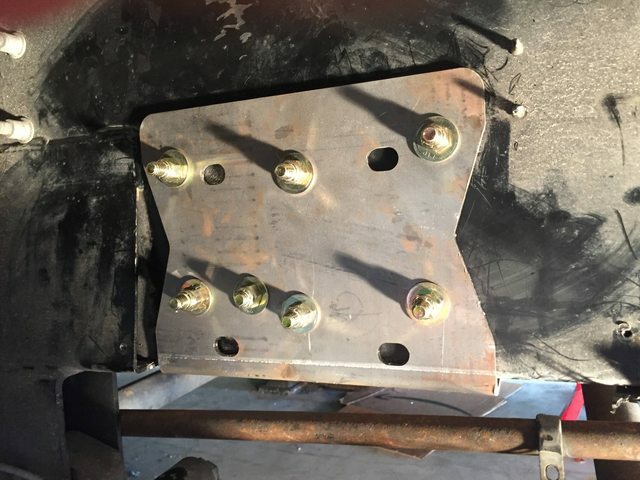 IMO, a closer look is in order before cutting/bending/welding anything. To slap a "Lippert" repair $500-1k. Lippert frames are not the only ones that can have issues. I would suggest everyone inspect their frame on a regular basis. I was finishing up repacking my bearings and found this behind the front axle right wheel. Cracking on both sides where the cross brace attaches. 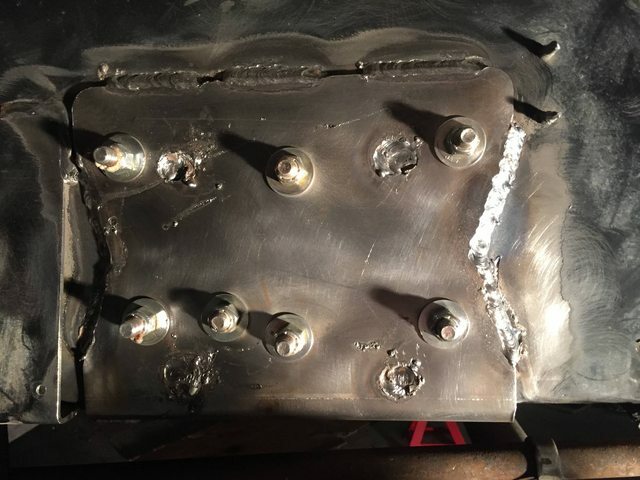 I did all the repair work my self except for the welding. Norco BAL sent the repair plates to me. Hmm... I think you might be on to something. I agree that further investigation would be a good idea. Using cross member supports like X-Factor will go a long way preventing this kind of frame cracks. The frames flex too much and the factory cross members cause a stress point where they are attached. The trailer tracks perfectly fine and the 4 year old tires look new all the way across the tread. Seller said he used it a handful of times since putting the tires on but who knows for sure. I used a creeper and inspected every inch of the frame. I found 5 horizontal cracks on both passenger and drivers Ibeams and a couple small cracks overall where the welds were garbage. Majority of the cracks are in very high stress areas when turning, right above the springs. There is a 1 inch dent under the passenger side Ibeam right above the front spring where the ubolt made contact from a bump or something. Thinking this is what caused the drivers side to bend. 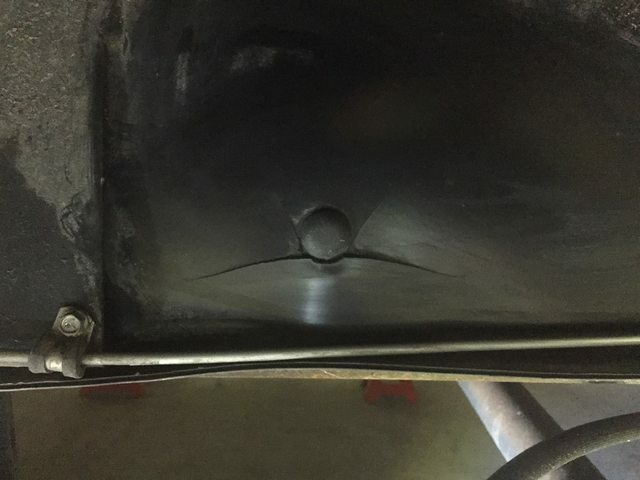 The drivers side hangers are bent outward bit no cracks in the welds. The passenger side looks straight as an arrow looking through the hangers from aft to front and vice versa. Just ordered...back under the trailer again.